Doing it in my kitchen since 2003. I was a little skeptical when I first considered cooking with Indy’s Bootlegger Brown Ale because, truthfully, its deep caramel flavors in are too heavy for me to drink. I DO love Independence Brewing Co.’s use of local art on their labels, however, so I really wanted to feature this brew, with the label design created by Austin muralists Blue Genie Art Industries. These cupcakes pair dark beer and dark cocoa, creating a rich moist cake without a heavy beer flavor. In fact, the caramel in the Bootlegger Ale enhances the chocolate. Yum! For the cake I used Dave Lieberman’s Chocolate Stout Cupcake recipe, originally published on the Food Network Website, substituting Bootlegger Ale for Guinness. And instead of using Lieberman’s cream-cheese based frosting, I opted for a lighter whipped buttercream recipe I saw on Pioneer Woman a few months ago. This recipe yields 24 delicious cupcakes, with just enough frosting to cover each one. Cupcake method: Preheat oven to 350 degrees. Open beer and set aside a few tablespoons for frosting. Prepare a 24-muffin tin with paper liners or butter and flour. Sift together cocoa powder, sugar, flour, baking soda, and salt in a large mixing bowl. Melt butter in a saucepan over medium heat. Remove from heat and whisk in beer. Add eggs one at a time, beating completely after each one. Whisk in sour cream and vanilla until liquid ingredients are thoroughly combined and smooth. Pour liquid ingredients into the large mixing bowl with dry ingredients. Stir gently until dry and liquid ingredients are just combined. Do not overmix. Fill muffin cups 3/4 of the way with batter, dividing batter evenly between 24 cups. Bake in preheated oven for 22 minutes, until a cake tester inserted in one of the cupcakes comes out clean. Allow to cool for 10 minutes in the muffin tin before transferring cupcakes to a wire rack to cool completely. Frosting method: Whisk together flour and milk in a small saucepan. Heat on medium, whisking constantly, for about 5 minutes. Mixture will thicken as it cooks; you’ll know it’s done when it is the same consistency as brownie batter. Turn off heat and whisk in beer until mixture is smooth. Allow mixture to come to room temperature before continuing. I was in a hurry, so I set the whole pan in a few inches of ice water in the sink to speed things up. It was cool in about 4 minutes. Using an electric mixer with beater attachments, beat together butter and sugar until it’s light and fluffy. Add the cooled flour mixture and beat on medium high for about two minutes, until the frosting has the consistency of whipped cream. Taste a little tiny bit. It will taste so good that you’ll want to eat the whole thing! Don’t do that. 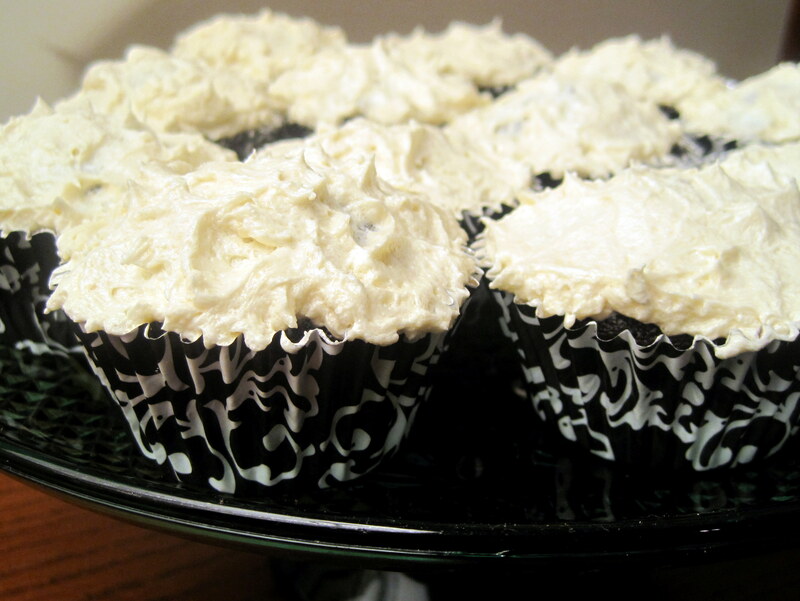 Instead, spread frosting on cooled cupcakes and enjoy!! 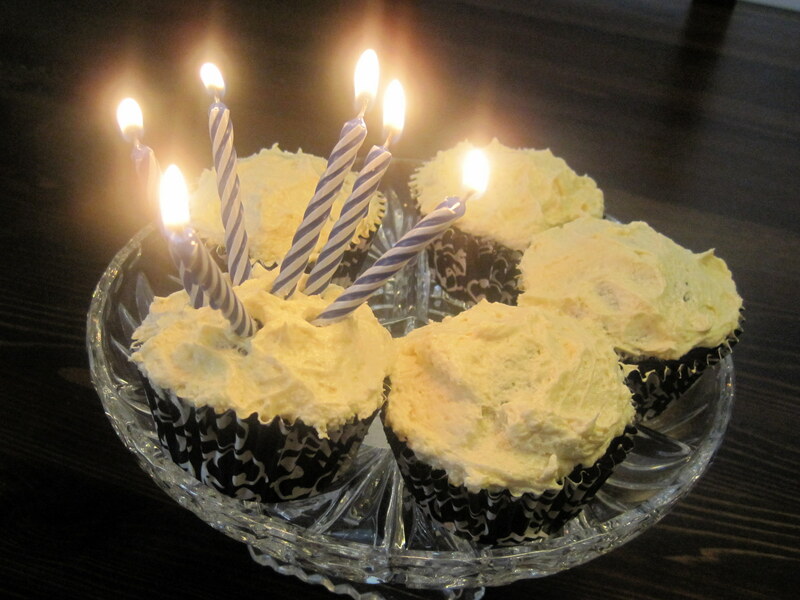 This entry was posted in Desserts, Recipes, Vegetarian and tagged Beer, Butter, Cupcake, Flour, Sugar. Bookmark the permalink. Wow- these sound tasty. I don’t often bake with alcohol as I often think the old boozy classic desserts are overkill. This looks intriguing, though. Misohungry.com would love these cupcakes. Let’s try this again: Big News! 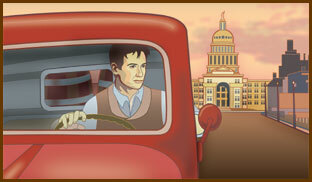 The Austin Gastronomist by Kathryn Hutchison is licensed under a Creative Commons Attribution 3.0 Unported License.